Review – A Good School by Richard Yates. It’s been a while since I’ve reviewed a book. As most of you may know, I’ve set myself a “challenge” of reading the Century Trilogy back to back. Well, I think that may have been a mistake. I am currently on the second book, and whilst I do really like it, I find myself only being able to read small chunks at a time. Now, this may have more to do with me starting substitute teaching and being exhausted every day, but I also believe there may be a psychological aspect due to the “challenge” aspect that I set myself. I decided to try and remedy this by reading something completely different. To make my lunch breaks in the day a little more interesting, I took a short (about 250 pages) book to read. This book is by one of my favourite authors, so I knew I’d enjoy it. Richard Yates’ ‘A Good School’ is often described as the 70’s version of The Catcher in the Rye. I tend to disagree with this statement; Catcher in the Rye focuses on teenage rebellion in a society that is blatantly against the main character. A Good School focuses more on a society that is providing everything for the main characters, at least on a surface level. The plot revolves around a group of adolescent school boys in a private prep school somewhere in Connecticut (most of Yates’ novels are set here and it is funny as I live here also, I can both what he is saying, and the complete opposite end of the spectrum!) that endeavors to churn out the best of the best in terms of future success stories. However, the plot spends an equal amount of time looking at the lives of the teaching faculty of the school – for they too are both entrenched and disenfranchised by the idea of this “good school”. 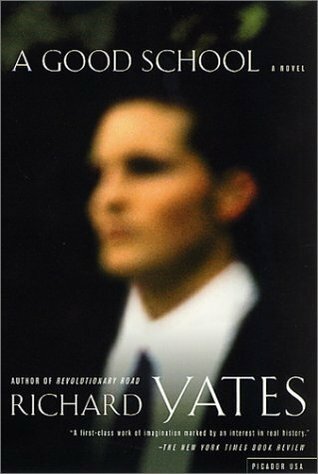 What I love about Yates is that he isn’t afraid of showing a broad emotional spectrum; pride, greed, vulnerability, anger, passion, and many other emotional states are portrayed in this short novel. With Yates, it may seem that he is all about doom and gloom, but really, he is about realism. These things happen every day, these emotions get felt every day, these consequences happen every day. There is no writing for the sake of shock value with Yates – everything is genuine and realistic. Yates wrote this book in the 1970’s, but set it in the early 1940’s. This ability to set a story in a time in which it applies perfectly, and yet have it also apply to the time in which it is published, is ingenious. For a short novel, it really does pack quite the punch. If you find yourself wanting a short read, but also a read with substance, I really cannot recommend this enough.